We lost my dad in 2010. Dad had been undergoing treatment for colon cancer the previous two years. He went through surgery, chemo, etc… because he wanted more time. Some of my most treasured life lessons are those I’ve learned from Dad while he was alive and since he passed. 1. Do what is most important now while you have time. After Dad died, Mom sent me a backpack he had bought. Inside this backpack was a list Dad had put together for his “dream camping trip.” A trip he never got to take because there was always something else that got in the way or was made more of a priority. 2. Never assume you have tomorrow. Dad was promised more time. He thought he had 20 – 30 + more years. He got two weeks. How differently would you live today if you did not know for certain you are going to get tomorrow? Would you forgive those who you have not forgiven? Would you say I love you more? Would you hold those you love close? Would you face your fear? Would you cease making excuses and commit to going after exactly what you want? If you focus on lack you will get more of what is lacking. If you shift your focus to all that you have and express gratitude for it (the air in your lungs, your ability to see the words on this page, the kindness of a stranger, ears to hear a baby cry,) you will realize all that you truly have. 4. You never have to look far to see someone else who has it worse than you. I’ll always remember Dad telling me this on the phone. He had just met with his doctor and was weighing options about whether he should do chemo or roll the dice that they got all the cancer in surgery. The doctor said he had about a 60% chance he was in the clear and chemo would bump his odds up to 80%. Dad did not want to do chemo and was dreading being sick. In the room next to him there was someone who opted not to have chemo and were given weeks to live with no cure. It put things in perspective for Dad. 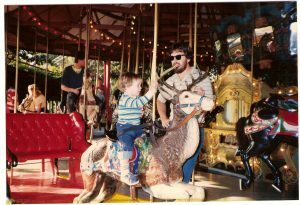 I held onto resentment towards my Dad for a long time because he was not the Dad I thought he should be. The reality is, is that I was unwilling to see him as a human. A human who was doing the best he could with what he had in any given moment. My unwillingness to forgive Dad for not meeting my expectations cost me a lot of time and opportunity with Dad. After he died, I had to work on forgiving myself. 6. In any given moment, people are doing the best they can with what they have. Our expectations are often that people should respond/behave/act as we would like them too. Wouldn’t it be wonderful if our loved ones were psychic and knew exactly what we needed from them?! Unfortunately life does not work that way and neither do those we care about. If extend grace to others in life we can realize that they are doing the best they can in any given moment. Doing this allows for space to forgive to let go and to cease holding onto pain. 7. People do not know what they do not know. My biggest regret in my life is I did get to know my Dad like I could have because I did not know that I was 100% responsible for 50% of the relationship and that I was viewing him through the eyes I had been taught to see him through vs my own. Life is short. Time is precious. Love is beautiful. To much time is lost when we hold onto our expectations of how things should have been vs celebrating the potential of how things can be. Is there something you are holding onto? I hope this has been helpful to you , and inspired you to think about some of the most important relationships in your life. If you find yourself in a space where you want to make your relationships better and need some help, send me an email by clicking here and let me know “Jesse I want some help in improving my relationships,” and I’ll reach out you.